Our seasonal kitchen decor trend report is here for Fall 2018! You don't need to completely renovate your kitchen to shift its mood from spring/summer to fall/winter. We're full of ideas for using your current kitchen design as a backdrop for seasonal - or annual - changes made via transient decor. 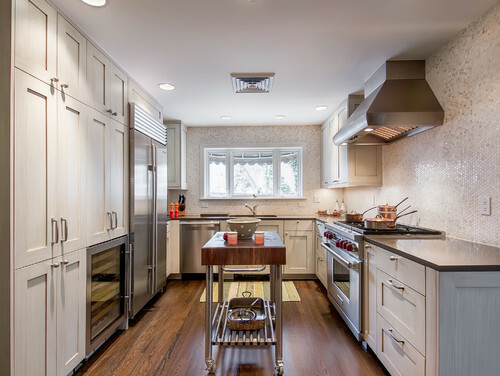 A timeless kitchen design is always a good place to start, because it serves as a neutral backdrop for inevitable decor changes homeowners desire along the way. Significant changes can be completed in less than a day, swapping out outdated light fixtures and switch plates, or changing out area rugs and window treatments. With that in mind, we have ideas to easily update any kitchen, for any style. With Autumn now arrived, most of us are already thinking in terms of warm colors. Luckily the trends and the seasons seem to be synced up this year, and the warmth of yellow, orange, and red are most welcome to the design-palette. The orange stools below are a great example of using decor to tie-in this kitchen trend. We’ve been raving over aged, warm metals like brass and bronze over the past year, and they’re all still reigning in the trends. But this season, copper has moved ahead of the pack. This trend is super décor-friendly, too. You don’t have to install a copper countertop, though there are copper-colored appliance panels that are pretty cool (who knew?) Even still, obvious as it may be, a copper kettle is a simple and practical way to bring some copper into your kitchen. And, you’ll be able to easily swap it back out when copper cycles out of the trends! Glass that is textured with an elegantly rounded yet linear pattern is referred to as fluted. This European styled glass can provide privacy to a cabinet, or gracefulness to a vase. 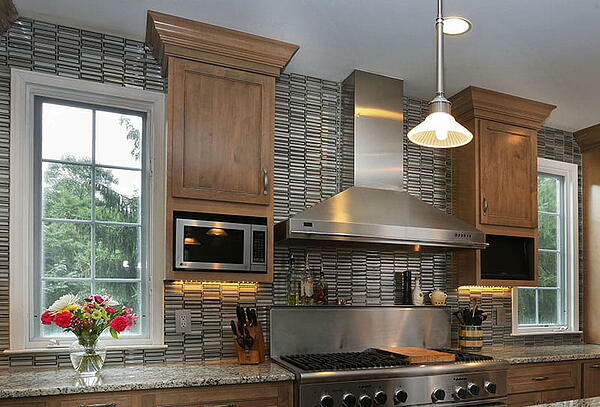 Fluted glass can be added to a kitchen in a number of ways. These light fixtures are an excellent example! Last year around this time, the color green was really big—and that was perfect for Fall and Winter of 2017 because we got to enjoy some greenery as the outdoor scenery changed. This year, green is back, but in a different form. Big, leafy plants are in, and they are perfect for kitchens! Add a healthy, potted plant to the room, and see the homey impact for yourself. Plus, did you know that keeping plants in your home can actually improve your indoor air quality? We also totally understand that not everyone has the greenest of thumbs, in which case just go for faux! Add there's no shame to that, even HGTV designer Joanna Gaines admits to using faux plants in her amazing interior designs. More and more home renovation shows are incorporating untreated, or untreated-looking, natural wood into home interiors. A trend is born! 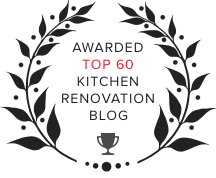 Being that we are talking about kitchens here, completely untreated wood might not hold up as well as it would in other rooms of the house. So, a light coat of polyurethane is probably a good idea, and will still retain a very natural look. If you have the time, energy, and funds to invest, installing a shiplap accent wall is a surefire way to work this trend into your kitchen. But, if you don’t have the aforementioned things, (I mean who even has time anymore?) then you could get yourself a new pair of wooden kitchen stools, or even a natural wood wall-mounted hook board. 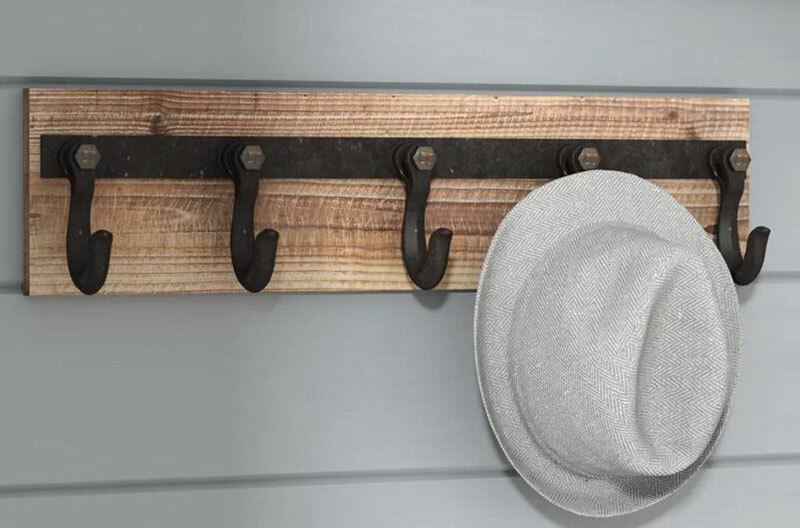 My husband recently made two DIY natural wood wall-mounted hook racks, and we love them. You can save some of that oh-so precious time and order a rack like the one below from Wayfair.com. We love when the trends cast their favor on practical items, and here we have an excellent example. Rolling islands are on the rise, which is such a nice option—especially for small and/or active kitchens, as well as budget-conscious homeowners. 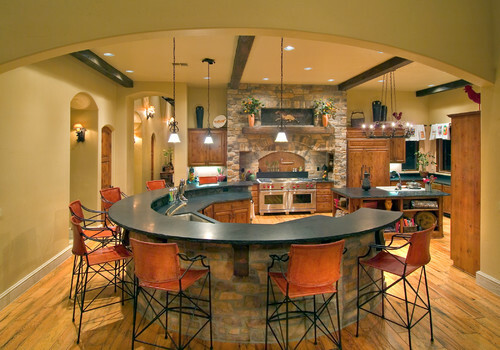 Dreaming of a kitchen island, but know it will take up way too much valuable space? How about a modest sized island that you can roll out of your way as needed? Bingo! We hope this trend has some good staying -power. Don’t be Blue... Actually, Yes—Be Blue! As we mentioned last season, navy blue is here to stay. But, this true for the full blue spectrum really. 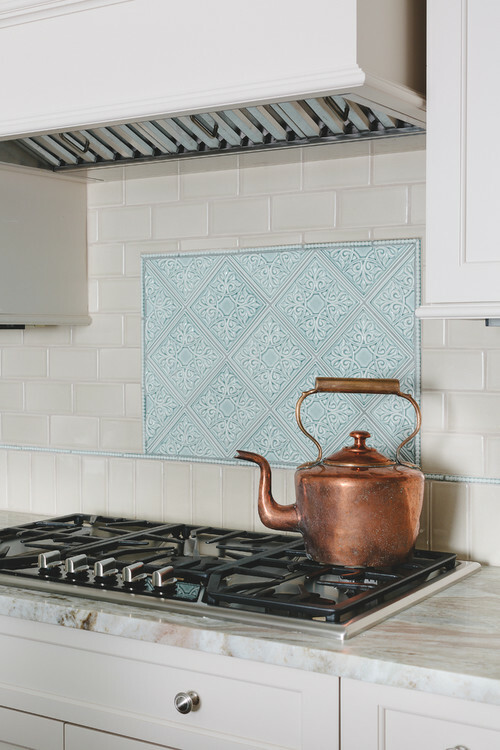 When coordinated well, blue in your kitchen will almost automatically bring style to your kitchen. 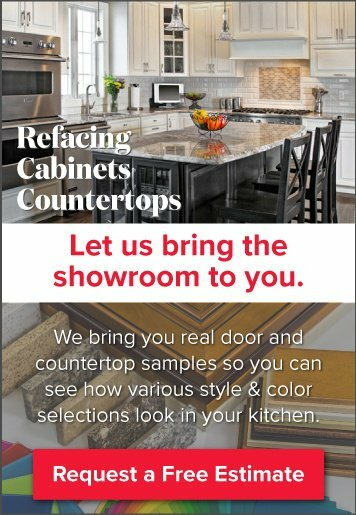 In fact, here at Kitchen Magic, we recently added a new color to our cabinet door collection—Colonial Blue. 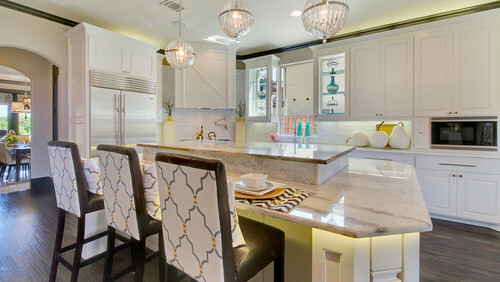 The kitchen below features the same color on a stylish contrast-island. 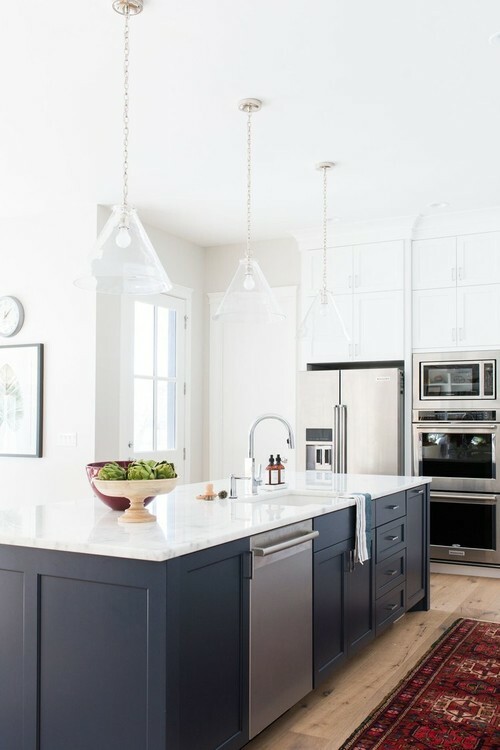 However, this article’s intention is to give you kitchen décor advice, so if new cabinets aren’t in the current budget, implement this trend by way of décor like vases, place mats, rugs, table cloths, drapes, small appliances… you get the gist! The microwave-over-the-range look is quickly becoming an indicator of early 2000's style. If you’re planning a remodel soon, steer clear of this—go for a range-hood and have your remodeler install a microwave that is built into the cabinetry, or a cute cubby for it like the one below. But what about the rest of us who adopted this trend back when it was in full force? Well many of us who’ve gone this route now realize it was a great idea in theory—not so much in execution. The amount of ‘head-space’ taken up by the big bulky microwave can be sorely missed by those who spend a lot of time cooking over their range. The microwave simply sits too low. Opening that space back up with an oven hood, even a modest one, and converting a cabinet or drawer to stash that big ‘ol microwave will make any home-cook’s heart soar! Appliance companies like GE offer microwave built-in trim kits that homeowners on the handier side, or experienced DIY-ers could install on their own. There is also always the counter, if a built-in or appliance cubby simply isn't an immediate option. 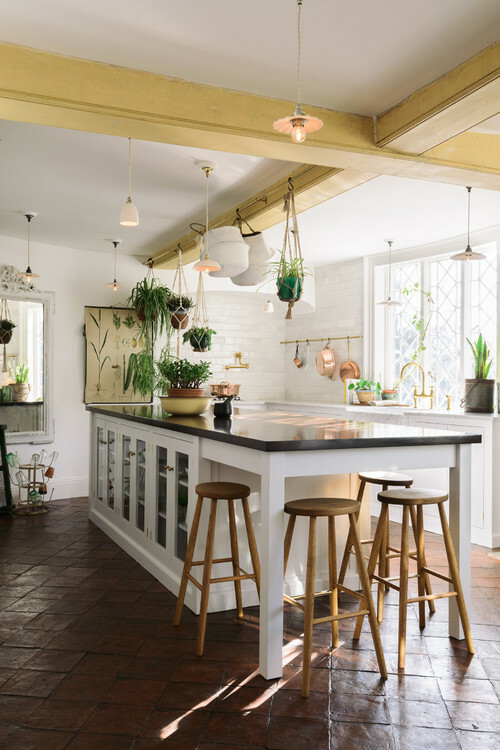 And for a sneak peak of what trends to expect next year, be sure to download the 2019 kitchen design forecast below!